Heart is the most important organ of the human body. Circulation of blood is a very complex process and the entire body is connected through an extensive, intertwined network of arteries, veins and capillaries for circulation. Arteriosclerosis is a defect occurring in the artery (blood vessels carrying oxygenated blood) walls. It refers to hardening of the normally flexible walls due to loss of elasticity of the arterial musculature. When young, the arteries are flexible due to the presence of a protein called elastin. As age advances, there is loss of this elastin causing thickening of the arterial walls. Atherosclerosis is another condition that refers to the deposition of fat plaques and cholesterol globules within the arteries causing narrowing of the lumen of the arteries. Arteriosclerosis is the result of old age. If the walls of the arteries are elastic, they can withstand the turbulence of blood flowing under high pressure which happens when we participate in sports, get angry or overexert in any manner. As the arteries grow harder and thicker, they become more and more resistant to the blood flow and hence, the blood pressure keeps rising as age advances or disease worsens. Atherosclerosis is a potentially fatal condition affecting the arteries that can be extremely fulminating when it affects the cardiac arteries. In atherosclerosis, there is a gradual increase in the deposition of plaque (consists of cholesterol, lipids, calcium, white blood cells and clumps of platelets) within the lumen causing narrowing or at times complete blockage of the artery. The cause of atherosclerosis is not clear but there are multiple predisposing factors like heavy smoking, obesity, diabetes, hypertension, genetic factors, and high serum levels of LDL and cholesterol, high alcohol intake etc. Pathology of atherosclerosis is that the patient remains asymptomatic for many decades even. The plaque which is formed within the lumen may be either stable or unstable. If it is stable, it will not move and remain at one position for many years without producing any disturbance in the circulation. But if it is unstable, it is very vulnerable to detaching from the site of attachment in turbulent blood flow and may burst into the circulation causing a mobile plaque which can settle and block smaller lumen capillaries. This plaque or thrombus which is formed becomes an embolus once detached from the original site and can block any artery. Symptoms of atherosclerosis are mild dizziness, light headedness, vertigo, palpitation and blurred vision. Partially blocked arteries will cause decreased oxygen supply and hence, give rise to pain in the affected part, a phenomena called ‘claudication’. Blocked arteries of a particular part .e.g. heart or brain may produce symptoms pertaining to dysfunction of that part. e.g. stroke or heart attack. Arteriosclerosis is essentially a process of ageing, thus doesn’t produce any symptoms. It is rightly concluded that a patient with arteriosclerosis may not have atherosclerosis but a patient with atherosclerosis will always have arteriosclerosis. Treatment of atherosclerosis is removal of plaque and putting in a metallic stent which will prevent partial and complete blockage of the affected artery. The second line of treatment is a bypass graft surgery where a bypass path is made for the adequate flow of blood only at the junction where the artery is occluded. There is no special treatment for arteriosclerosis as it is hardening due to loss of elasticity. Arteriosclerosis is disease affecting the walls of the arteries due to ageing whereas atherosclerosis is a disorder affecting the lumen of the arteries due to plaque buildup. Atherosclerosis is the result of high cholesterol diets and poor exercise while arteriosclerosis is a genetic trait, that cannot be changed. rachita. 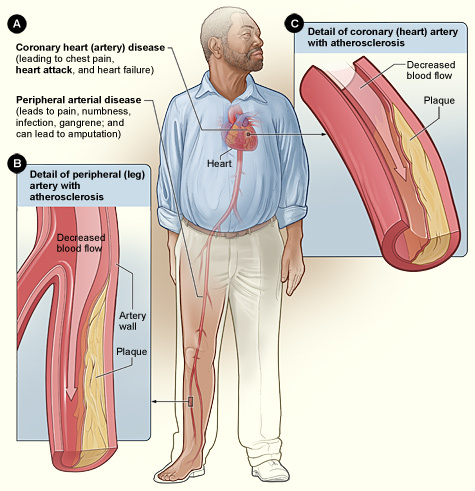 "Difference between arteriosclerosis and atherosclerosis." DifferenceBetween.net. April 12, 2018 < http://www.differencebetween.net/science/health/disease-health/difference-between-arteriosclerosis-and-atherosclerosis/ >.